Two and a half weeks after the Opening Ceremony of the Winter Sochi Olympics, and 298 medals later, the world was wowed with a spectacular display of fireworks at the Sochi Olympics Closing Ceremony. Fireworks are a common sight now at such large events with international acclaim, with their colours, sounds and effects – they appeal to the masses irrespective of nationality, age or gender. The statistics surrounding the Sochi Olympics are astounding. According to CNN, there were 15 sports, 98 events (including 12 new ones), the whole Olympics cost an estimated $50 billion, and was viewed by an estimated 3billion people worldwide. 2850 athletes competed from 88 different countries, and between them consumed approximately 265,000 litres of borscht! Well it’s not surprising therefore that this feat should reach its climax at the Sochi Olympics closing ceremony with an unbelievable fireworks display. The Sochi Olympic fireworks display lasted approximately 10 minutes. For those of you who missed it, here is another chance to watch a video of it now. 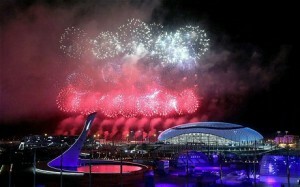 Check it out here http://www.telegraph.co.uk/sport/othersports/winter-olympics/10656605/Sochi-2014-Winter-Olympics-closing-ceremony-fireworks-display-in-full.html. The music of Tchaikovsky was chosen to accompany the fireworks – very apt given he was one of the most prominent Russian composers of all time. Here at Fireworks Den we enjoyed how the colours red white and blue were particularly visible – a patriotic nod to the Russian flag! We have our own patriotic firework here too – check out Best of British on our site! If you are looking for fireworks of a particular colour, please contact us at Fireworks Den where our experts are on hand 7 days a week to help you. We look forward to seeing you soon. This entry was posted in Sochi Olympics on February 27, 2014 by Becky.